Our better understanding and in-depth expertise coupled with the team of experienced professionals assist us in delivering excellent quality Grains Color Sorter Machine. Strong in construction and need less maintenance, this machine is used to remove discolored, insect damage & spotted grains. Offered machine is precisely fabricated by making use of premium grade components at our well-defined manufacturing unit under the experts' direction. 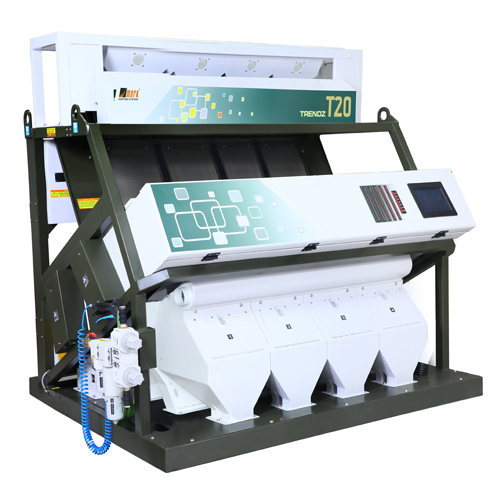 The offered Grains Color Sorter Machine can be availed from us in numerous technical specifications. steel panels are assembled into a compact and stable frame structure, study enough to avoid the passage of any vibration to the CCD electronic components. Side covers for dust protection. Open setting up allows an easy and fast cleaning of the sorting machine. Highly efficient vibrators allow the throughput to be varied electronically and mechanically,Optimal sorting capacity is assured by regular and constant product flow. A scientific matching of length and inclination together with a smooth abrasion-resistant surface ensure a very high sorting accuracy by means of the best line up to the view point and the ejection point. Channel shape and pitch are provided according to the dimensions of the product to sort. 28 channel chute Ã¢â¬â 6 mm channel. Ejection system consisting of highly durable and reliable fastest solenoid valves. Very High efficiency ejector nozzles for rejecting product with high precision and minimum compressed air consumption. Ejector status of each channels in evidence in the real time by means of a LED band. Filter regular and condense discharge unit. Channels shape and pitch are provided according to the dimensions of the product to sort. Wide flat chutes available as well. Copyright Â© 2016-17 by Promech All Rights Reserved.